THE Newcastle Jets are high on confidence, and it's partly thanks to new striker Milos Trifunovic. The Serbian, who has only been in Australia for a few weeks, scored a second-half brace to hand his new side a shock comeback 3-2 win over Melbourne City last week. That was the team's third win from four A-League matches this season - the same number of victories it managed in all of last season as the club fell apart at the back end of the dysfunctional Nathan Tinkler-ownership era. In ominous signs for the rest of the A-League, Trifunovic said he was still adjusting to the style of football played Down Under. "In Australia, football is played much faster and very offensive, (therefore) I believe it will take me a bit more time to adjust," he said via an interpreter ahead of tonight's clash with Western Sydney. For the Wanderers, attacker Romeo Castelen is back from injury, and Josh Macdonald has been promoted to the squad. Newcastle is unbeaten in its past five meetings with Western Sydney (won two, drawn three), but it has never beaten the Wanderers at home in the A-League, with two draws and two losses. Jets defender Lee Ki-Je has scored in back-to-back encounters against the Wanderers - his only two goals in the A-League. Western Sydney has only managed one win in its past 16 away league games with two draws and 13 losses. 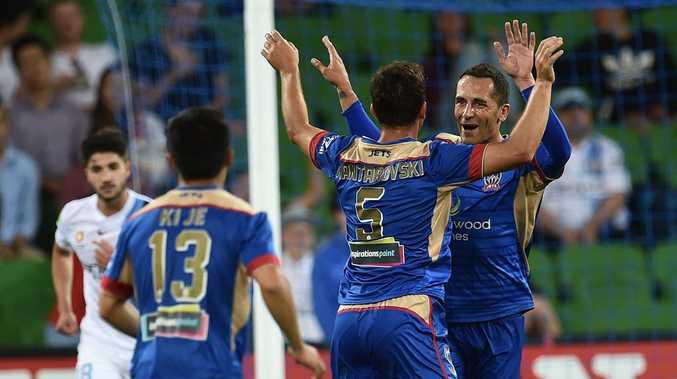 Victory for the Jets would give them three consecutive wins in the A-League for the first time since November 2013.